As promised, here are all the entries from my first ever contest. The requirements were a picture, with photographer credit, along with a description of the costume, why this character, and how it was made. I was very impressed by the amazing talent and range of costumes that were entered. I look forward to talking with many of these costumers in the future (yes, all of you may be on my "to feature" list.... which grows bigger every day!) There were 19 out of the total 20 entry spots that were filled so get ready a big mini feature! Entries are listed below by the number the cosplayer received. By the way, I must say that all these pictures and descriptions are awesome! It is fascinating why we choose certain characters and the many different ways you can create them! Chaos was made using a variety of different thicknesses of craft foam and styrene plastic, the gem in the chest was made out a resin and is backlit by an LED tap light behind it. The wings were made using PVC pipe for the skeleton and then covered with the vinyl and fabric shown. I chose Chaos because it was the first full costume that I have ever made(albeit with plenty of help from friends) I am proud with how it came out and shows off my prop-making skills very well with the gun prop. 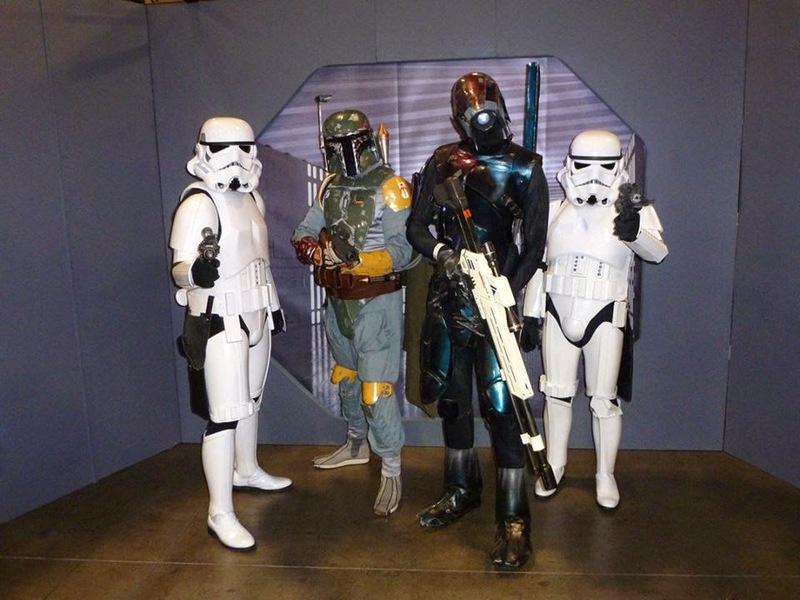 I couldn't find the photographer to save my life but he shoots for Fantasy Con. 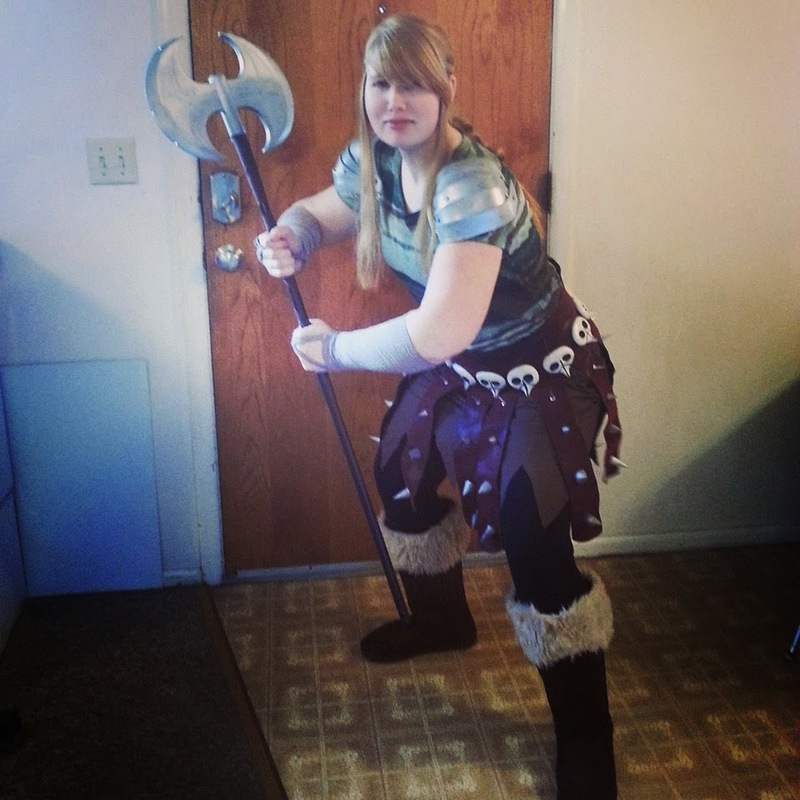 I chose to enter this cosplay because it is the first one I've made entirely from scratch. Everything except the wig and boots is hand crafted by me. And unfortunately this is the only picture I have of it, so there isn't a full shot yet. Wow, where do I start? Well, I adore the character. 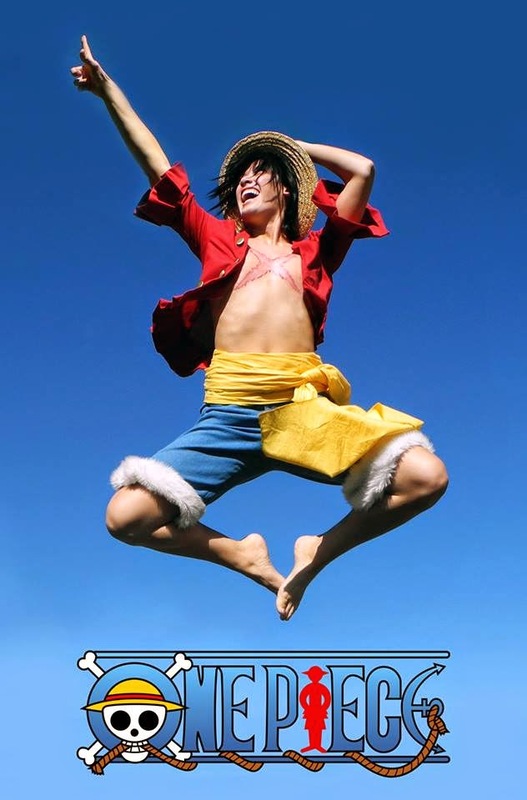 Luffy's passion for his dreams and zeal for life and adventure is why I love the character and when I cosplay him I can't help but be beyond happy go lucky. While his costume is rather simple looking there are so many details and inner construction that goes into this costume to make it look right. I also chose this costume because it would test the believability of my open chest binding. (Cause well, there isn't much fabric to hide in) I am a 36 C and in order to make this costume work with the binding I had to get creative with the inner construction of Luffy's shirt that holds 'the girls' in and down while I run around like a lunatic to make sure I wouldn't accidentally flash someone! 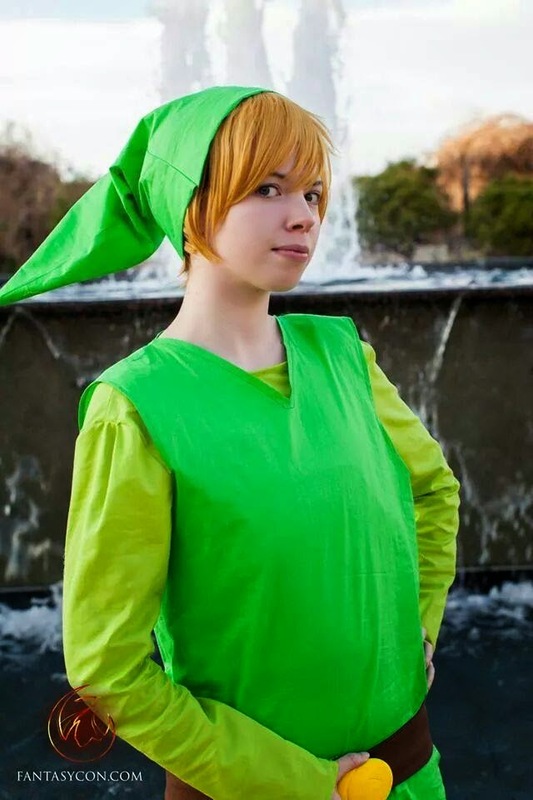 I adore this cosplay and love any excuse to cosplay in him! I love Vivaldi! She's just so full of confidence, verve, and herself! Her costume also looked to be a challenge, and I was ready to do something to stretch me sewing-wise. It was tough for many reasons. First, she has four or five different colors of red that she wears at the same time, and they all blend well to make a really cool whole that doesn't overwhelm the viewer with any one particular shade. Finding that many reds that worked together in the type of fabrics I wanted was daunting. Then all of her hearts and pleated trim variegates from green to purple and back to green. They don't make sparkly fabric that does that -- at least not that I could find in Southern Utah. I double-layered it all with transparent iridescent fabric. The pattern went: purple on purple, purple on green, green on purple, green on green, green on purple, purple on green - over and over adnausium. Then I had to applique on all those hearts. Can I tell you how tired I am of pinning and sewing hearts? 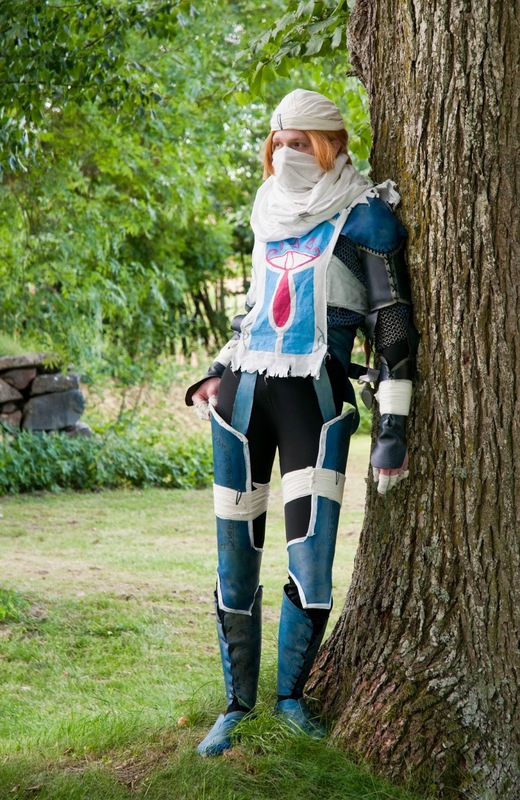 I chose to do this cosplay because I am a huge fan of The Legend of Zelda series and Sheik has been a favorite of mine since I first saw her in Ocarina of Time, She’s also always my first pick in Super Smash Bros. Melee and Brawl. Everything, aside from the bottom most layer, were made by me. The armor pieces (the thigh, upper and lower arm, and pauldrons) and shoe covers are made of wonderflex and friendly plastic, the lower leg pieces and the corset-like middle piece are foam covered with fabric, the hat, scarf, and shirt are all made from the same fabric (the hat and scarf made from scraps and sewn together haphazardly to give it a more beat up and rugged look), and the shirt is painted with flexible acrylic paint. You can’t see it in this picture, but the lower leg pieces also have a design painted on the back. The bottom most layer is a blue leotard, fingerless gloves, and black leggings, which I bought. This cosplay was made with all real leather, real chain-mail, and real medieval shoe-making techniques. 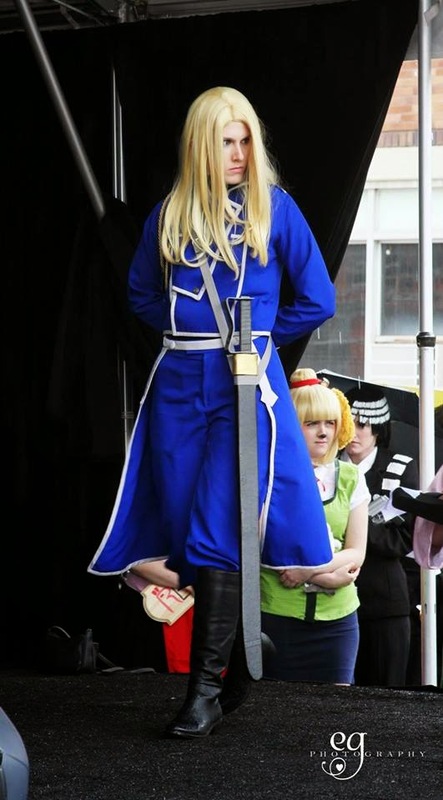 I chose it because it was my first cosplay, and the one I’m most proud of regarding craftsmanship. I bought the jacket from a thrift store for only $7 if I remember correctly, embarrassed to say it was a women's blazer but it was too perfect! I used white cloth sheets and cut them up into little strips for the stripes on his jacket. For the props, I used the airsoft guns I already have and no longer use. I spray painted the gun silver, used acrylic paint for the design on the slide, painted his symbol on the grips, and opened up the gun to remove springs, trigger assembly, etc to render the airsoft not fire-able and make it convention safe. 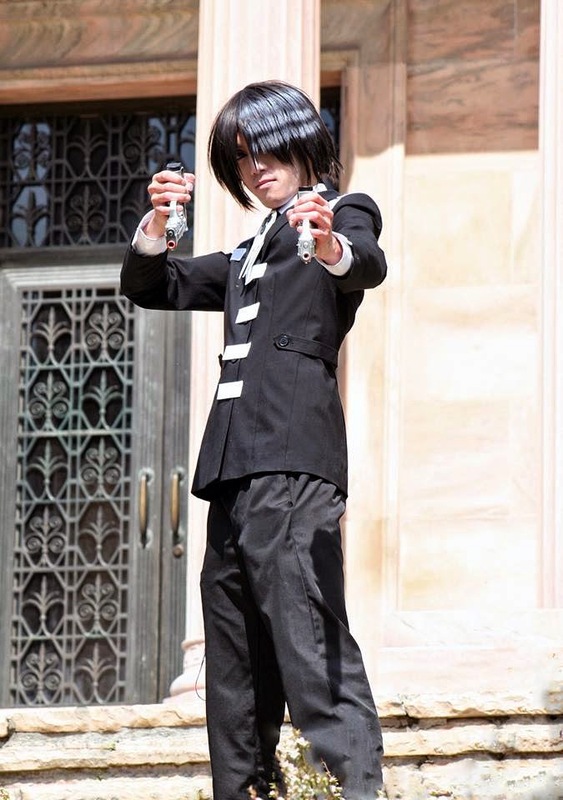 I chose to cosplay Death the Kid because he is one of my favorite anime characters! The tie was made out of foam sheets and resin coat. This cosplay may not be fantasy related because I really don't have a favorite fantasy theme character. 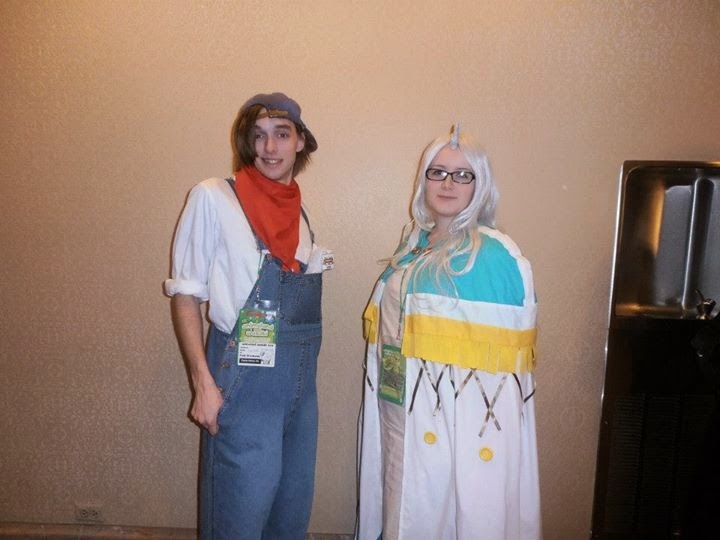 And it was something I can put together fast and easy in time for the con. Lucky enough for me, he dual wields two 92FS guns which I already have, making this the cheapest cosplay I've ever done. Completed at an estimate $50 (including props) compared to my average $200-400 per cosplay. I'm hoping to impress fans of the series and attendees for Fantasy Con on Friday! Photographer was my roommate on my phone. 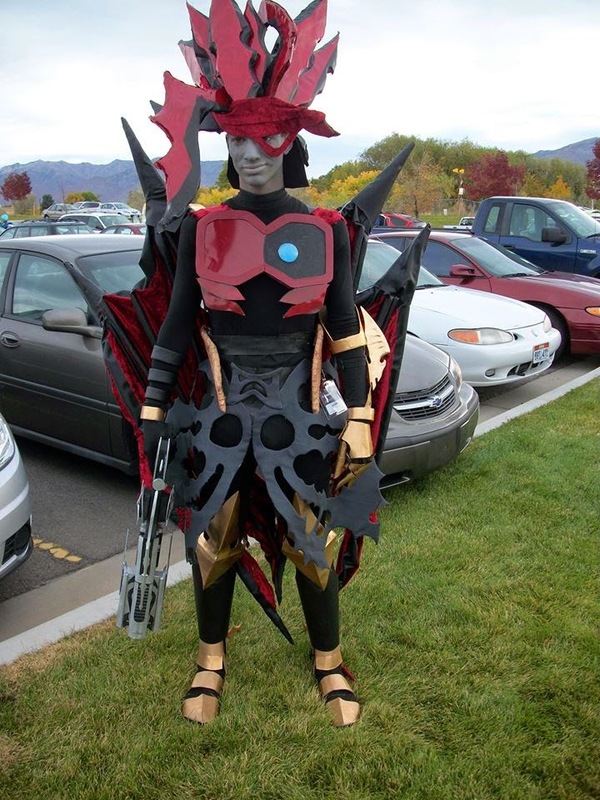 This costume was my first experience in the world of cosplay and I quickly became addicted after creating it. I chose Astrid for many reasons: 1) I absolutely love the movie. I cannot wait to see the second one. 2) Out of all of the characters in the movie, Astrid really connected with me. She's strong and independent but still lets others get close to her, an aspect many strong independent fictional females seem to lack. She isn't without her imperfections either, which makes her even better in my eyes. And she has a nifty dragon. And finally 3) I look similar to her. She has a round face, blue eyes and blond hair. While that isn't the most important part of cosplay, I like finding characters who share similar physical features as me so I can "become" the character. Not having to wear a wig is also a plus. I sculpted all of the spikes and skulls by hand, made the pauldrons out of Sintra, and painted a white t-shirt to get the unique design. Many of the pieces are re-purposed items and many are items that I fully crafted myself. I chose Legion because he's only been done a few times and I like to pick the hard things to do! Made with Wonderflex and craft foam. It was made from a moving box, covered in textured wallpaper. Wheels are cookie tins and bamboo runners. Eyes are CD's and flashlights. Face was a ski mask with RC car parts, and the eye sockets were foam board. The pants were made by gluing actual trash to pants. 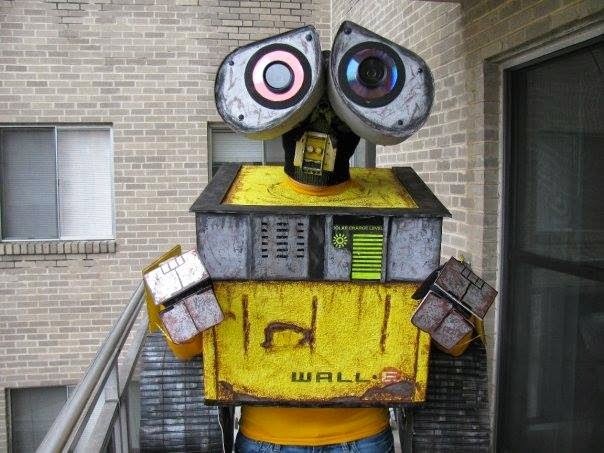 Graeme simply loves Wall-E and that's why he made it. 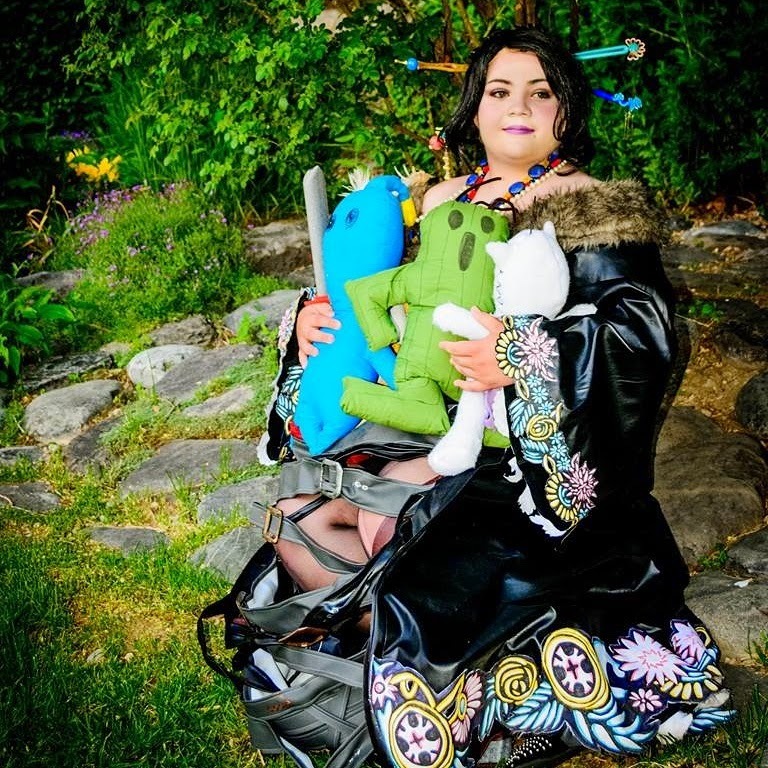 Tibbers was commissioned from Pannon, FemNunu was made from white fur (Long hair was upholstery fur and short was plushie fur) with a corset as the base. Amumu was made with a Halloween pumpkin, plastic Easter eggs, monsters university longjohns, and 15 yards of emerald flannel cut into strips. Annie was made by hand with a store bought sweater. We love to do groups as a family and we all play league of legends as a family. Seemed like a perfect match. Olivier is my favorite anime character of all time. She's tough, but also funny in a brash way, and extremely loyal. I love the power and respect she demands, and how she's one of the most high ranking military officers, even as a woman. She wouldn't let a silly thing like gender inequality slow her down. Muahahaha! 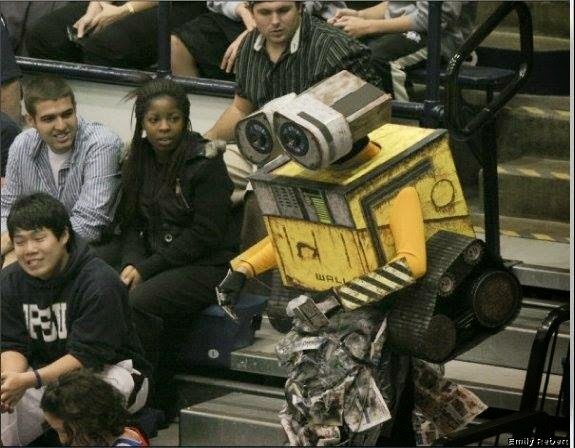 This was also the first costume I made that I patterned myself, and I'm uber proud of it. Photo Credit goes to Eurobeat Kasumi Photography. Nearly everything on my costume was handmade, from the beads to the bra! All the detailing on the obi and skirt were hand-painted and the kimono sleeves are the product of my very first time gradient-dyeing. The fabrics I chose, while a bit strange, were picked so that the costume could easily be worn in water for photos. This is technically a 'throwaway' version, but it won a judge's award at Anime Los Angeles for 'Attention to Detail'. The part I am most proud of on the entire costume would definitely have to be my Belladonna staff. It was my first wood prop and the head of the staff took hours of carving with a an electric jig-saw and sanding it down so that it was nice and smooth. The handle is made from a flagpole that unscrews at the center, which is great for traveling! Photo credit to EGP Photography. 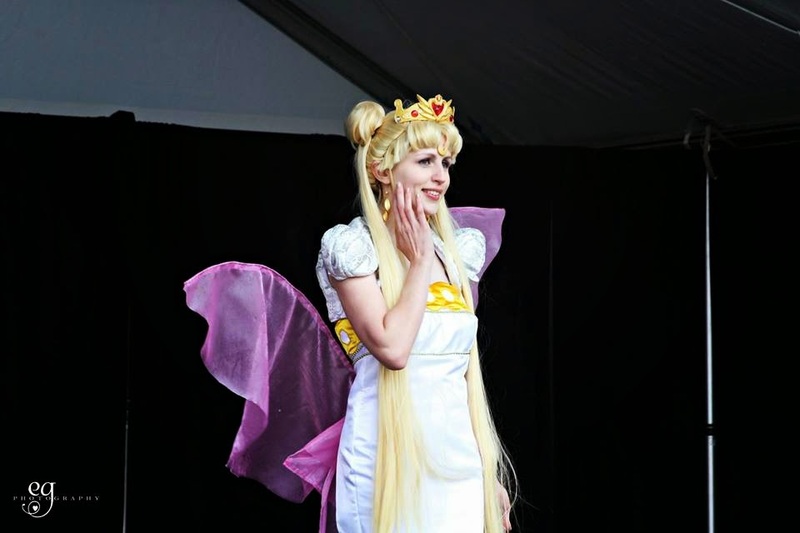 This costume was a dream project of mine since I've been in love with the Sailor Moon series for 20 years. It is amazing to see how popular it is after all these years. I used an empire dress pattern for the base and tailored it to be more of a mermaid silhouette. I made the crown from scratch using worbla and Apoxie sculpt. The hair is put together from pieces bought from Arda Wigs. The bow is made with fabric and wire with snaps to fasten it to my back. The bolero was a personal touch to make the outfit more regal. 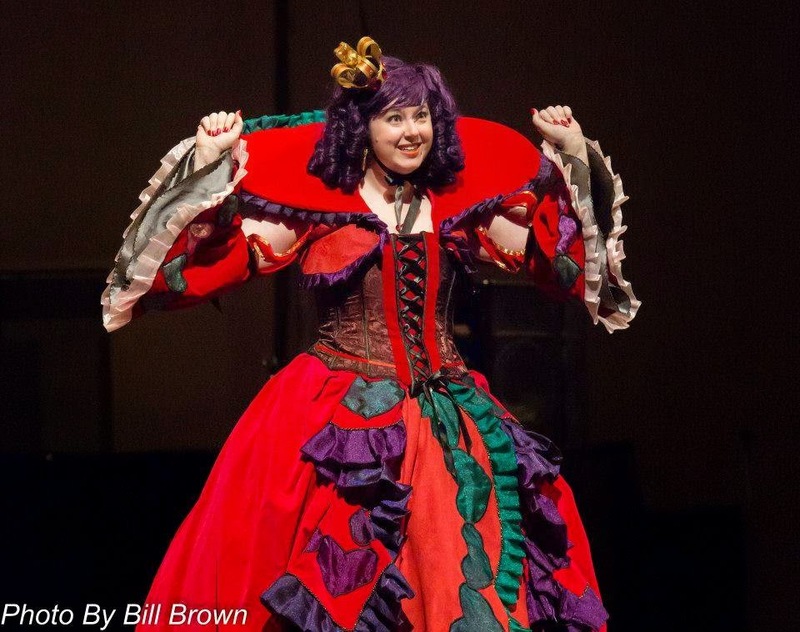 I loved wearing this for the first time on my birthday at Nihon Matsuri! My college's anime club wanted to do a live Pokemon hunt, so some of the members dressed up as Pokemon for the day. I found the skirt in a second hand store, the boots were on sale, and already owned a fuzzy brown hoodie. 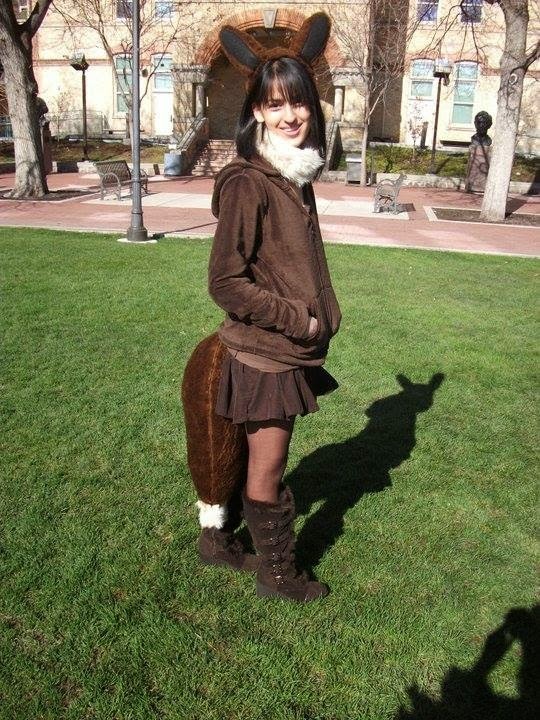 For the tail, I created a pocket like shape out of fur and used stuffing to make it in the round shape, and attached it with Velcro to the skirt. The neck fur was created like a necklace, with clasps in the back to close it off. The ears were made with wire inside to keep them up, attached to a headband. I chose Eevee because it was one of my favorite Pokemon when I was a kid, so when this chance came up to be it, I jumped at it. 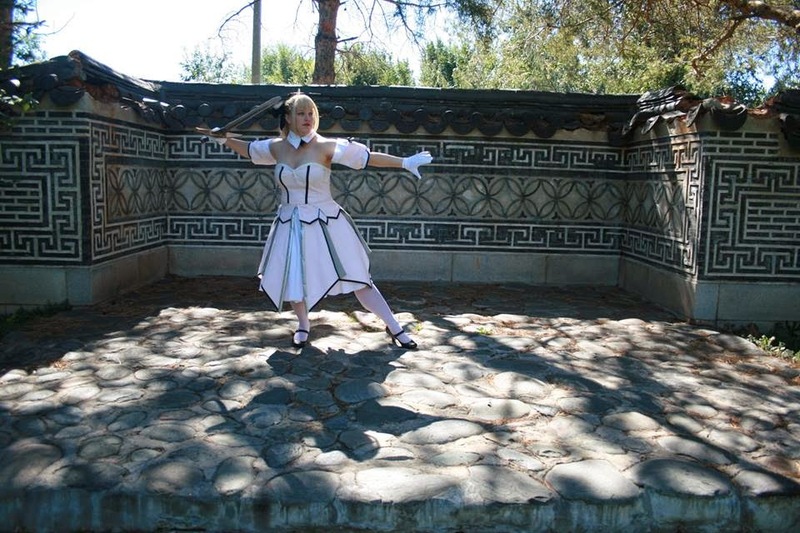 Saber Lily was made using a duct tape body pattern, the first free-form pattern that I've created from scratch. All the pink sections are 2 fabrics glued together with pellon to get a lighter, more delicate pink than I could find at any store. I absolutely adore how the petal skirt came out, even though it took forever to do all the trim. This outfit continues to amaze me as it is extremely sturdy (zip ties for boning, tight and double stitches) and has put up with quite a bit of abuse. The armor is the first big project I've done with Wonderflex and has taught me a lot about the material, as well as the inherent problems with hot glue. 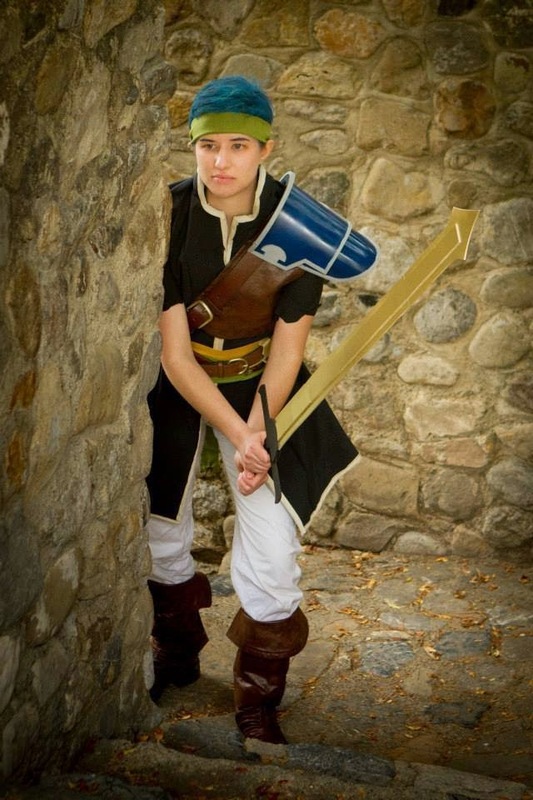 I chose to do this cosplay because I absolutely love Ike, but I feel like people only know him from Super Smash Brothers. I wanted to recognize the original source material by doing an outfit other than the one that appears in Brawl. The tunic is made from a suiting and the pants from a light linen. The pauldron and a lot of the details are done in Sintra and I sprayed my own hair blue. I used some patterns I had sitting around for the base cloak and dress. I then pulled the rest together by making my own patterns. I chose this cosplay because she was my favorite character from that game and I wanted to do something that I hadn't seen cosplayed before.